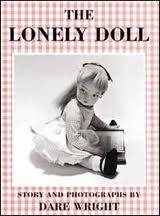 When I was little, my favorite picture books were The Lonely Doll series. In the first book, the doll, Edith, meets Mr. Bear, a stuffed bear, and his son, Little Bear. In subsequent books Mr. Bear is her guardian. I remember vividly one picture of Edith turned over Mr. Bear’s knee as he spanked her for doing something naughty. Today there are many things about these books that would make parents and librarians cringe, but the same could be said for much of the beloved children’s literature of my childhood. The author, Dare Wright, had a strange and complicated upbringing which was documented in Jean Nathan’s biography, The Secret Life of the Lonely Doll. As the original lonely doll it’s not hard to understand why she would turn to Edith and the bears for comfort. My childhood, on the other hand, was, as far as I remember, remarkably mundane; and yet I, too, play with stuffed animals. And I’ll wager I’m not the only other adult who does. I may, however, be the only one who will admit it in public. This may be an inherited predilection. When my uncle was in the army, his beloved bear sent him notes, via my grandmother. There’s a photo of my parents, mom pregnant with my older sister, cavorting with two stuffed dogs and a ’57 Chevy. When I went away to camp, our cats wrote me letters. 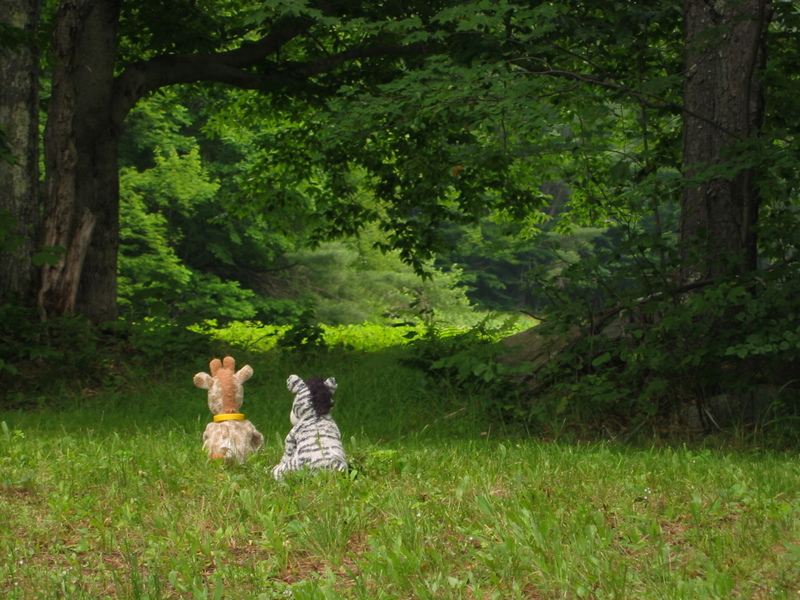 And when my daughter went to her first sleep-away camp, two of our stuffed animals sent her a photographic accounting of a big adventure. (It was slow going, they don’t move fast, and it took almost three dozen photos to document the outing, but they were very patient with the photographer.) Below is a shot of them near the beginning of their journey. If you’re paying attention you may want to point out, huffily, that when I was at camp, live animals wrote to me, not stuffed ones. When it comes to anthropomorphizing, I don’t make much of a distinction between them. Neither, it appears, did Ms. Wright. I will concede that when there are real animals on the scene they tend to demand more attention than the stuffed ones. At the time of the great outing above, however, we had not yet adopted Boo and Scout, our cats, so the point is moot. And if we had had the cats, we would not have been able to document an outing with them. It’s not that we wouldn’t have wanted to, but they would never grant us the unfettered access to their activities that our stuffed friends do. Judy, your animal scene is adorable, and if Dare Wright’s were, too, I wouldn’t have minded so much. But I found her work really creepy and scary, not endearing at all. I understand that there’s value in that uncomfortable teetering on the boundary between fantasy and reality, but as a child, and still, as an adult, I preferred to be all in or all out. Lisa, I agree with your thoughts. There was something about the slash of a red-lipsticked message on the mirror that seemed quite violent. And the spanking: as a child, as I was mesmerized by this brazen betrayal on Mr. Bear’s part, but I recall feeling, on some child’s level–that that scene was sexually charged and quite dangerous. Thanks for bringing the Jean Nathan bio to my attention. I read it this weekend — enlightening (and disturbing). I actually recently came across two of the Lonely Doll books in our family library, and the series features strongly in my memories of childhood reading. On the one hand, I envied Edith in her cosmopolitan settings, yet at the same time, the books had a disquieting intrigue about them and invited a kind of voyeurism. The bio of Dare Wright provides helpful context, though what a sad story about her relationship with her mother and how that impacted her sense of self. Please to upload the whole photo series! That photo is soooo cute! What fun parents Hanna has! And your cats wouldn’t have sat still for a photo session!